Versatile by design, these precision-engineered façade solutions offer an endless range of creative possibilities to enrich the built environment. Constructed from strong and durable fibre cement, SVK façades have adaptability at their core. Panels in a varied range of colour and finish options can be made to measure or cut on site to create unique external facades for large or high rise installation by playing with shape, proportion and pattern. Lightweight and quick to install, SVK panels can also be used alongside other façade systems or traditional materials on multiple substrates, with a variety of fixing methods available. This high-performance façade solution provides superb fire, weather and impact resistance for long term product reliability, as well as being low maintenance. The SVK Fibre Cement Façades collection features four decorative panel ranges – Ornimat, Decoboard, Puro Plus and Colormat. Panels in a spectrum of bright and neutral shades are available in a range of textures, from naturalistic light sanded cement to smooth matte modern surfaces. Inspiring and striking façades can be easily created by mixing colour, texture and form. Bespoke panel options are also available to suit any construction or renovation project and deliver an even greater aesthetic range. 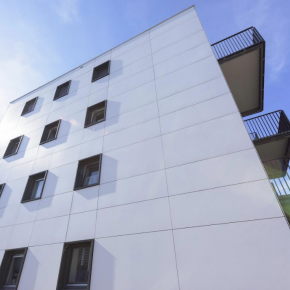 Richard Brown, Category Marketing Manager for Wall products at Wienerberger, commented: “SVK Fibre Cement Façades are a building solution which embodies safety, durability and creativity.